Let me start by saying, I absolutely loved this book. It took me on an emotional journey, and left me needing to recover. Embracing the Rain is a wonderful romance with a hint of suspense that holds you captive until the last page. Author, Amy Bledsoe, had the rare ability to make me care about every-single-one of her characters, even the animals! The depth of the characters, their back stories, their quirks, and more importantly flaws — it all added up to very real characters that were well-rounded. Realistic ups-and-downs in the relationships kept me eager to find out what happened next. The romance, and romantic tension were not only believable, but palpable. This book is based in a small town in Oklahoma, and centers around two characters who both have dark pasts, and secrets that they want to keep hidden. As the characters fell in love, I found myself rooting for them, and wanting to know how the rest of their lives unfolded. If you’re looking for a great romance that’s an easy read, with a bit of suspense, be sure to pick up Embracing the Rain by Amy Bledsoe. 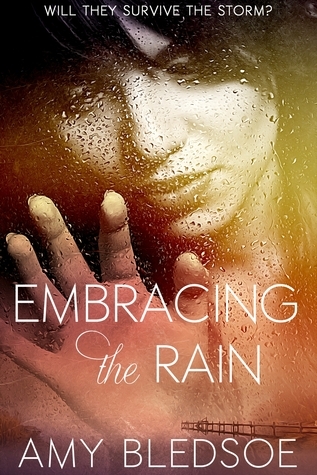 Find Embracing the Rain on Goodreads. Find Embracing the Rain on Amazon. 1000 Twitter Followers Celebration – Query/First-Five Critique Giveaway!